Executive Business Centers provides a professional image for you and visiting clients in the Denver area. We cost-effectively manage your office space in Denver so you can manage your business. Our commercial offices for rent have flexible lease terms so you can rent short-term for six months, long-term for several years, or renew your contract year to year. Flexible leases can expand and contract as your business needs change, helping you avoid the long-term commitments and financial obligations of traditional leasing. 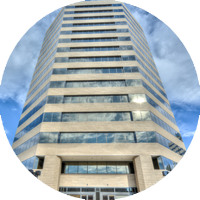 Executive Business Centers has the perfect office space in Denver to fit your small business needs. Click Here to see our floor plan and Contact us to set up a tour today! Private office with lock and key – work in peace and comfort! Spectacular views of the city and mountains from our top floor locations! Access to 10 conference rooms in our DTC locations and to 650 worldwide business centers! You deserve more out of your office space rental in Denver, so trust the premier providers of commercial offices in the Denver Tech Center area. We strive to fit every company’s needs with a variety of floor plans and sizes. Executive Business Centers offers receptionist services, access to conference rooms and more! Don’t wait, contact us today to schedule your tour. Not ready for a full-time office space but still need a professional image? Click here to see our Denver Virtual Office Programs or click here to see our conference room rentals available for your next meeting!